One of the reasons I have visited Arizona and other Western states once or twice a year for the last 25 years is, apparently, for solitude --- to be in a place where I can listen to and see things I have difficulty experiencing in the Eastern urban area where I live. Even in a park near my home, the sounds of traffic, airplanes, and people’s voices are ever-present --- the horns and motors, the drone of planes, the bits of “he said, and I said, and can you believe” kind of conversations that I weave in and out of, a constant soundtrack that obscures a more subtle layer of things to see and hear. Last Wednesday I stood beneath this enormous concrete cross about 25 miles east of Nogales, Arizona, just past the wispy community of Lochiel, constructed as some sort of memorial to one of Coronado's fellow conquistadors by the side of the dirt and gravel road we traveled on through the fields of the San Raphael Valley, making our way to the old mining town of Bisbee. There was no one around. Not a car. Not a house. Not even livestock. We passed two vehicles on our journey --- a Border Patrol agent and a mailman in a dusty pickup truck, both doing their lonely work along a not so well-traveled road. Given the lack of man-made sounds and structures, I was entranced by the few things I did see and hear when we stopped our car. 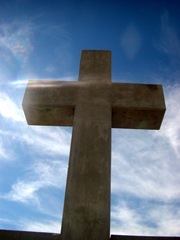 There was the cross juxtaposed with the clear, empty blue sky --- a testimony, a claim, a reminder that we are not alone. 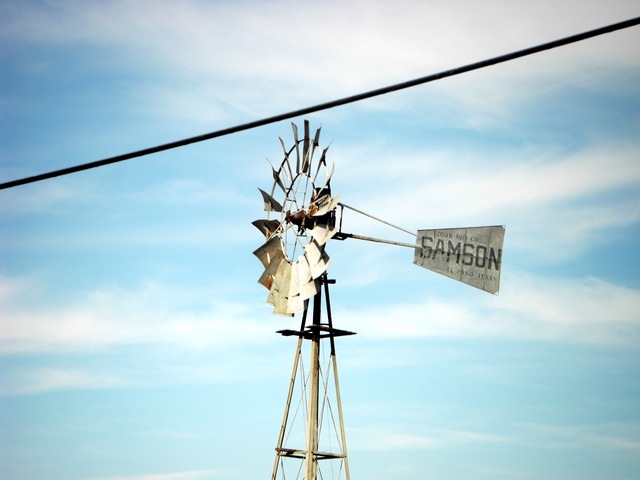 There was a windmill flagged by the biblical name of Samson. Surveying the landscape, there was a single shade tree, perhaps an Arizona sycamore or scrub oak, golden fields of grass, called llanos, as far as I could see, and mountains and hills on three sides --- behind us, the Patagonia Mountains, north of us, the Canelo Hills, and east, the Huachuca Mountains --- their colors changing as the sun moved lower in the sky, shadows growing longer with day’s end. Listening carefully, at first I heard nothing, just silence. But then I began to notice the soft rise and fall of the wind, the gentle rustling of the grasses, the occasional squeak of the windmill as the blades turned. 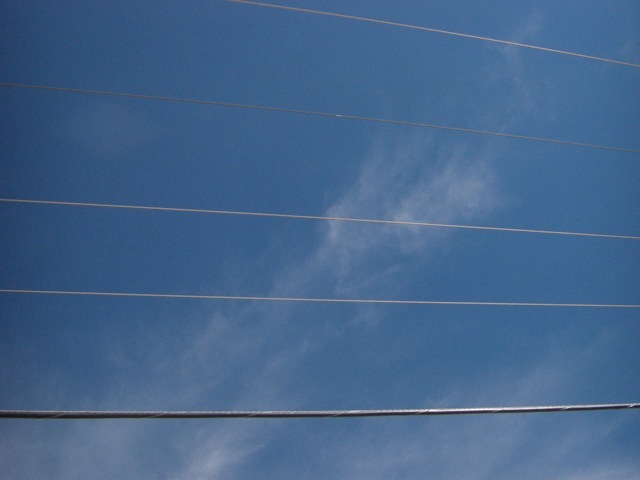 I heard and saw a few cactus wrens, alighting for a time on the telephone lines stretched overhead, and I looked up and noticed how the wires form a musical staff, the wind’s whistling sound like a song stretched over them. I looked at my watch and realized that seconds and minutes and hours don’t mean much here where time might be measured by the position of the sun, where most days are the same except for the variables of weather. Let’s just call this ordinary time, where no clocks are ticking, no appointments waiting, where there is no “breaking news,” where what happened today on the stock market is of little interest, where the machinations of the politicians in Washington have little impact, where no one cares who did what to who in Hollywood or what happened on The Office last night. If I lay down here and slept, awakening on a new day, it would likely be the same. 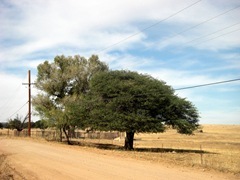 The tree would still be doing its important work of photosynthesis and shade-bearing, the windmill still turning, if there is wind, or not. The cross would still boldly if silently make God’s claim to every square inch of this universe and make restless travelers like me consider a Kingdom where a king comes not to take the riches of the land and make vassals of its peoples but to give not only riches but His life away. Christ, the King of love. It might rain, or it might not. 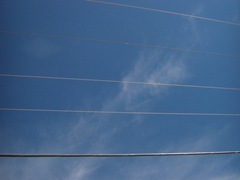 The wind may blow, gently or with bluster, or not, faintly humming over the telephone lines overhead. The Christmas season for me would be lacking without the music of Jerry Read Smith and his wife, Lisa. Jerry's hammered dulcimer accompanied by Lisa's flute have for years bookended Advent through Epiphany with an instrumental accompaniment. And today, Thanksgiving, as I write this I am thankful for the contribution that their music has made to my life. About 15 years ago I was booking a concert series for my church when I remembered an album of hammered dulcimer music I bought some time in the Seventies (that era before the compact disc), The Strayaway Child, the first album recorded by Jerry. It was awesome. I had never heard a hammered dulcimer before and was moved by its sound. When I was searching for artists to appear as a part of our concert series, I thought of Jerry's music, and yet I had no idea if he was a Christian or if he would appear in a church. I called him. I asked him an innocuous "how would you feel about appearing in a church?" and was treated to a 45 minute testimony of his conversion and life since conversion. He told me he was playing at a folk festival where he also sold dulcimers (because he makes them as well) and a bearded hippie simply walked up to him and said "Jesus is the bridge, man," and that haunted him sufficiently that night that it brought him to God. With that, I invited him to come, and he did, and he kept coming for a number of years until he gave up playing live. Jerry is one of the most intense people I have ever met, pursuing whatever the need or goal of the moment is with passion --- whether making dulcimers in his workroom, conversing, playing music, praying, or being your friend. It was natural to invite him to be the focus of this special Christmas 1999 edition of Wide Angle Radio. You'll hear his passion (and wife Lisa's sweet moderating influence) in the interview and music. 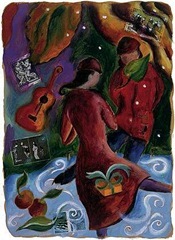 You'll also enjoy Christmas songs, both original and traditional, by Bruce Cockburn, Brooks Williams, Phil Madeira, Pierce Pettis, Matt Auten, and Claire Holley. It's one of my favorite programs. Listen to the program here. It gave me great pleasure to also work with Jerry to bring to fruition a whole album of Christmas music, One Wintry Night, which I highly recommend for this Christmas season. Purchase it here. Someone once told me that they disliked Fall because everything is dying and it makes them sad. I suppose I can understand that, but I've never felt it. For me Autumn is like one last glorious flame before the night of Winter descends, the long-awaited rest after all the activity --- the vacations, the swimming, the compulsion to be outdoors and active when you'd rather curl up inside with a book, the preparations for a new school year and then the beginnings of school and a host of other activities. I get tired thinking about it. Despite the premature press of the commercial Christmas, like nature, I'm winding down, ready to let it all come to a rest. I walk the streets littered with leaves and it reminds me a well-lived in home, papers and books strewn everywhere, the litter of life comforting, like my desk and study writ large. Everyone who sells anything wants me to think about Christmas now, but I try not to. I want to savor Fall not as a prelude to the real thing --- the secular Christmas --- but as part of the real thing. Thanksgiving remains decidedly not Christmas for me. And one thing I do not want to hear until December 1st are Christmas songs. So I began thinking last year: what is the soundtrack of Fall and, more particularly, the soundtrack of Thanksgiving? Since there are few songs about Thanksgiving, in picking my soundtrack I did so in perfect subjective freedom. Revisiting my playlist this year, I found little to change, dropping Brian Wilson as too "pop" for my list, adding Peter Himmelman's "Gratitude" (for obvious reasons) and James Taylor's "Carolina On My Mind" because it reminds me of home, as well as Jars of Clay's rendition of America's "Lonely People" because, well, the reality is that holidays are a lonely, lonely time for some people. I picked 22, because that's what filled the disc. I noticed a few things about what came to mind. First, I gravitate to the acoustic sounds. 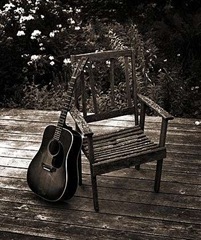 I think that the music of home for me, where I was raised listening to traditional country music (nothing like what is on the radio today), is acoustic music. Buoyant or quirky power-pop didn't seem to have any place here (though Charlie Brown made it). Second, these songs are not the "praise - Jesus - I'm - so - thankful" songs of the CCM world, though I haven't anything against them. They simply do not remind me of Home or Thanksgiving. Third, they are not all happy songs, as there is a recognition that some people are trying to get Home and can't, some have lost their homes or family members, and for some Thanksgiving with family brings tension and arguments. Yes, there's a definite streak of melancholy here. And yet, I think the general feel of these songs is joy, and joy is far better than happiness. And finally, there are no songs that suggest Christmas. This is, after all Thanksgiving, the climax of autumn, and while the rest of the world may think it a mere pause in the Christmas shopping that is already underway, I don't. No Christmas music, and no Christmas lights until the days after Thanksgiving! 1. Come Before Winter, by Jerry Reed Smith. An instrumental start with the title echoing Paul's request for Timothy to "do your best to get here before winter" (2 Timothy 4:15). I think of it as a call to friends and family to come and gather before winter. 2. In the Bounty of the Lord, by Claire Holly. A gospel bluegrass number that celebrates what God gives us. The style is reminiscent of music I listened to growing up. 3. Here in America, by Rich Mullins. The start of a great album, this is a kind of updated "This Land Is Your Land," a non-patriotic celebration of America. 4. Gratitude, by Peter Himmelman. "I'm glad that I can see the brown eyes of my daughter. . . . Forgive me if I lost a sense of gratitude." Himmelman, an orthodox Jew, knows Who to thank. His song is a confession of how we take things for granted and forget to be thankful to our Creator. 5. Carolina on My Mind, by James Taylor. Introducing the song recently, an aging Taylor said, "I miss my Dad, my dog Hercules, and my home." When we get older, our thoughts turn to our first home. 6. Thank You, by Jan Krist. It wouldn't be Thanksgiving without saying "thank you," and Jan manages to lace the thanks with enough melancholy and angst to keep it real. She's a good friend, and hearing her music brings many memories. 7. Covert War, by David Wilcox. Wow. If you had a family like this, you wouldn't want to go home for Thanksgiving. Fireworks at the Thanksgiving meal! Sad, but real. 8. The Water is Wide, by Eva Cassidy. Beautiful voice. Classic song. Trying to get home and can't get there. 9. Rumours of Glory, by Bruce Cockburn. A song about common grace, about seeing God everywhere. It'll make you thankful. 10. Follow Me, The Innocence Mission. I grew up on John Denver, so to hear this song conjures up memories of high school and friends. But I like Karen Peris's tender vocal on it here. 11. My Father, by Judy Collins. My father didn't make many Thanksgivings with me, as he died when I was 14. I remember him on this day. 12. Thanksgiving Day, by Ray Davies. Kinks front-man Davies can claim the only legitimate song about Thanksgiving! He eschews his usual sardonic wit and writes a warm tune here, and the most rocking thing you'll hear on this playlist. 13. Be Thou My Vision, by Van Morrison. It wouldn't be Thanksgiving without a hymn, and this is likely my favorite, with a very Celtic delivery by Van. 14. Love's Gonna Carry Me Home, by Pierce Pettis. Home again. Another southern singer-songwriter. 15. A Charlie Brown Thanksgiving, by George Winston. Watching Charlie Brown is a part of every holiday. Besides, it's a bit of a pick-me-up. 16. Homeward Bound, by Simon and Garfunkel. Mainstays of my high school and college years, and this song is again about that longing for home, "I wish I was. . . ."
17. Wanderer's Song, by Brooks Williams. One of my favorites by Brooks, this song is about how all roads lead home. 18. Come Thou Fount/ Grain By Grain, by Matt Auten. Gorgeous hymn, and a reminder that God is the fount of every blessing. 19. Lonely People, by Jars of Clay. How many lonely people spend Thanksgiving with only their TV? "Well, I'm on my way back home. . . ."
20. River Where Mercy Flows, by Julie Miller. I love Julie's songs, and the tenderness and fragility of her voice is disarming. Thank God for His mercy. 21. What Wondrous Love, by Jars of Clay. Another hymn favorite. Thank God for his wondrous love. 22. 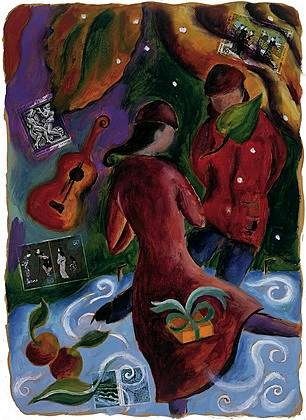 Homecoming, by Jerry Reed Smith. An instrumental coda which reminds us, I think, of where our real Home is, where it will be Thanksgiving all the time. Well, that's it. I played this for my wife, again this year, and she said it still didn't sound like Thanksgiving to her, and I said what's Thanksgiving supposed to sound like? I don't know for sure. My kids don't like it, but this is some of what it sounds like for me. Listening to yet another episode of Wide Angle Radio, this one from November 1999, I'm drawn back in time once again, this time to Albuquerque, New Mexico, the site of the annual Folk Alliance convention that year. It was an unlikely place for a rag-tag lot of sun-deprived, rusting folk musicians, and yet here we were. I was hosting a showcase for the six or seven artists then on Silent Planet Records and had the idealistic notion that we would gather these artists, some of whom had never met, in a pre-convention "retreat" in Santa Fe, about two hours north of Albuquerque. We took over a bed and breakfast there and spent a couple of days hanging out. It was an odd assortment of folk, some with a natural affinity for one another, some not, but looking back, we had a great deal of fun --- eating, drinking, and hiking around Bandolier National Monument. One afternoon I assembled them all together, thinking I would prompt some thoughts about why we do what we do. I read a bit of Frederick Buechner's Telling the Truth: The Gospel As Tragedy, Comedy & Fairy Tale, the central idea being that what we were about as a label and as artists was in telling the truth --- that truth being about the Fall (tragedy), our redemption (comedy), and hope and restoration (fairy tale). Listen to Buechner now: "The Gospel is bad news before it is good news." Oh yes. There was evidence of it even that week; after all, aren't artists known for large egos? That's the tragedy. "But it is also the news that he is loved anyway, cherished, forgiven, bleeding to be sure, but also bled for. That is the comedy." And after anger and irritation and failure and jealousy, there was plenty of that --- laughter about our failings that grow humorous in retrospect, smiles, and long walks in airy desert canyons seeing the cave dwellings of a people living thousands of years before us. "It is impossible for anybody to leave behind the darkness of the world he carries on his back like a snail, but for God all things are possible. That is the fairy tale. All together they are the truth." Yes, looking back now, that week seems a bit of a fairy tale but also a forecast, in its best moments, of the promise of what is to come. So, in the end, Buechner was right. The truth is tragedy, comedy, and fairy tale. Those few days there in Albuquerque, we witnessed that truth. The showcase? It was a bit of a flop. The retreat? Imperfect, even tragic, but comic in those moments of grace that shown through. I had great hope, and while I was disappointed aplenty, I still believe and have hope. That's the fairy tale. If memory serves me correctly, there in that bed and breakfast was where we interviewed Steve Black for this episode of Wide Angle Radio. One day there in New Mexico I sat across from him at a cafe. He said, "You know, I'm not much of a Christian." And I said, "Thank God it doesn't depend on you and me." When you listen to this episode of Wide Angle, imagine yourself sitting in a courtyard, the clear blue sky above you, a dry desert breeze faintly stirring, doves cooing in the cactus behind you, and Steve Black singing "In my dream the morning star/ Reveals the king of heaven's power/ In my heart I know, in the morning hour/ I'll be on my way" ("Going Home", from the album Going Home). Want to go there? Listen to Episode Two here, or just click on the Wide Angle Radio logo in the right sidebar. It's always difficult to put words to those feelings you have when you enter a building or room or walk through an urban area and have an uncomfortable, unsettling sensation that something is not right. We are not at ease, perhaps anxious, perhaps riddled with feelings of isolation or alienation. Our first reaction might be to look for an escape, to find a place where we are settled, to a place that is orderly, stable, calm, restful, and composed --- to a place of wholeness. There are, I suppose, a multitude of things that may not be right about the manmade structures that surround us, but one I can think of now is the lack of a sense of settledness that derives from the juxtaposition of a structure against the intensity of the forces it is pitted against, something de Botton even dares to call elegance and what we could just as well call grace. Just now, for example, I placed my open palm on a pane of glass in the window by my desk. It's cold to the touch. I look outside and it's dark and somewhat foreboding. But here, just two thin panes of glass and an insulating bit of air away, I am warm, sitting comfortably in a brightly lit room, surrounded by familiar books, the hushed vocals of Simon and Garfunkel deeply settling my soul, providing a history, a settledness that extends far back into the recesses of adolescence. This sliver of glass is elegant, beautiful in reminding me of my dependence on the protection of something and (ultimately) Someone greater than me, Someone who stands between me and all that is cold and dark and troubling. Would the room be as inviting without that juxtaposition? Not really, as intangible and as difficult to articulate as that sense of elegance may be. But there's more. Alain de Botton gives voice to this settledness, something most of us can identify with, when he recalls a scene from his childhood: "We feel as safe as we did when we were children being driven home in the early hours by our parents, lying curled up on the backseat under a blanket in our pyjamas, sensing the darkness and cold of the night through the window against which we rested our cheek. There is beauty in that which is stronger than we are." Exactly! I remember this precise sensation and the same sense of lying curled up by the heat vent on the floorboard of the car at my mother's feet, comforted by the warmth, the snugness of the small space, the knowledge that while the road was rushing by only inches from my body, I was safe, listening to the music of hushed conversations between my parents. Whether we walk through a neighborhood or down a city street, or lie in our bed watching the elongated shine of headlights from cars passing by on the highway outside, or sit cloistered in our living room with a good book, there is a sense in which we all desire a comforting, secure, settled feeling, a anchored sense that while the night is cold and dark and troubles real and imagined impinge, there are greater forces --- forces we sense tangibly in an elegant streetscape, or a warm and inviting room, or the welcoming lobby of a building or restaurant, or even the four-wheeled walls of an automobile --- with us. In fact, I suggest these longings express our desire to know our Creator, the Architect of our souls and the only one who can truly settle us in our homes, and in our final Home. Just as we sometimes look for love in the wrong places, for happiness in some imagined ideal --- a different job, a different spouse, or a real vacation where we get "away from it all" --- we build our homes at times not knowing what will really satisfy us because we do not know what it is we long for. We do not know ourselves. We build homes with large airy rooms and open spaces because we want more light, more open movement, or more room for entertaining, thinking we will enjoy and be happy in such a space, and yet we often end up feeling small and alone, our voices echoing off the walls, insecure in our great rooms that seem not to hedge us in and protect us as did our familiar, smaller, older (albeit dimmer) dens. Having said all this, it would be easy to ascribe too much importance to architecture, to become deterministic, yet as Alain de Botton says, our built environment does not so much command as suggest. That being the case, when we plan our homes, decorate our interiors, and sketch the contours of our cities, what is it we want to suggest? And as Christians, those who believe in a normative truth, goodness, and beauty, what would we want to suggest? That depends on what we believe about who we are and what we long for, and what is true, good, and beautiful. I don’t have the answers, but I do think elegance (or grace) is a part of what we want to suggest; we want our built environment to suggest our dependence on God, our need for God, and remind us that He alone is able to keep out the dark of night. We so often get it wrong not because of psychology (as de Botton says) but because we don’t know the One who made us and, thus, we go looking for the ideal in all the wrong places. Some even call that sin, a turning away from the Architect of Life. 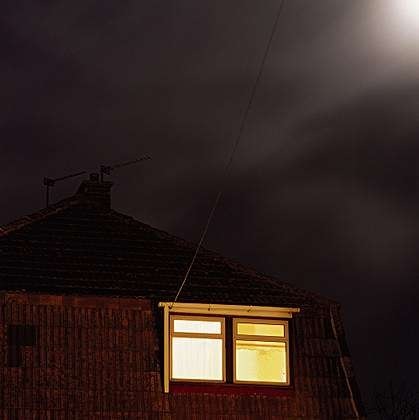 It's 11:38 p.m. You just finished paying the last bills, put away the dishes from dinner, put in a load of laundry, folded what seemed a hundredfold small articles of clothing, fed the animals, and put the toys back in the toy chest (even the Matchbox cars pushed under the sofa). You hoist a brimming laundry basket and, dimming the last light, wearily turn and head up the stairs. At the top of the stairs you set the laundry basket down, thinking you will look in on your son and daughter where they sleep. You stand at the side of their bed and watch their deep breathing, the sweetness of a face at peace, see the perspiration on their face as the surplus energy of a full day of play oozes out. A feeling of joy wells up in you, unbidden, the kind that swallows up all your deep weariness. And then you sense something else underneath the joy, something you recognize as a profound sadness, and you turn to leave, an unspoken prayer caught in your throat. It's late June, and you just walked the over 300 steps to the top of Bridal Vail Falls in the Yosemite Valley. You recognize the reality from John Muir's detailed descriptions or Ansel Adam's black and white photos. You're out of breath from the ascent, but the view from up top is rewarding. The water in the fall is full, thundering over the edge of the cliff, filling the air with mist, a dramatic evidence of purposeful and not accidental creation. It is enough to provoke a prayer of praise, heartfelt and, yet, woven into the prayer, a longing for more and an inarticulatable sense of loss. Saturday evening there is a party in your home. Good friends gather around a fire, laughing, enjoying memories. You're talking about your children, when they were young, laughing at some funny comment, remembering some shared event. Laughter almost brings tears. You sip a cup of your favorite English tea, the mug warming your hands. Looking at the familiar faces around you, you exhale a great thankfulness, happy for this moment together. Then, a certain wistfulness begins to impinge, stealing some of the intensity of that sense of wholeness. You know the time together will end. On the other side of whatever beauty we experience --- whether family, nature, or friendship --- lies a sense that it is incomplete, temporal, and sure to be dashed by some event, word, or deed. When we know beauty, it's as if we stare into Eden, for a moment, our soul flooded by a sense of what it is like, and yet close behind comes the realization, common but displaced by temporary amnesia, that the way back to Eden is barred, "cherubim and a flaming sword flashing back and forth to guard the way to the tree of life" (Gen. 3:24). A neon sign flashes "NO RETURN." An ominous guard, feet squarely planted, arms crossed, bars our path. Trespass is not allowed. In his commentary, Matthew Henry says that this image was, for Adam and for us, a reminder of God's displeasure, of his judgment, that the way of deliverance and of wholeness is not back to Eden but on to a new heavens and earth, promised through the seed of the woman. Viewed this way, what we sense when we peer into a moment of sublime beauty is both the judgment of the Fall --- that temporal and incomplete feeling of joy, thankfulness, and peace we have in an experience of beauty --- as well as the hope and expectation of something more --- a recreated, perfect heavens and earth. God gives us a vivid visual reminder that the way back to Eden is foreclosed as a prompt to set our hearts on what He promises --- an experience of beauty and wholeness that will never end and which is not undercut by sadness or longing. The beauty we now experience, whatever its manifestation, is, as C.S. Lewis once said, "not the thing itself; they are only the scent of a flower we have not found, the echo of a tune we have not heard, news of a country we have never yet visited." This beauty "must bear at best only a symbolical relation to what will truly satisfy." Many people stop at beauty. Don't. Look through it both to see the way to Eden foreclosed and, yet, the promise of true Beauty yet to come. "No longer will there be any curse" (Rev. 22:3). In this Great Reversal, we'll be bidden to take and eat of the tree of life. And we will.